Associate – Law Firm – Summit, N.J.
Gearhart Law is seeking an associate level patent attorney (Mechanical/Electrical/Computer Engineering or Computer Science) to join our growing firm. Responsibilities include patent preparation and prosecution, trademark searching/filing, drafting license agreements, counseling clients on the enforcement of their rights, counseling clients on avoidance of their competitor’s rights, preparing non-infringement and/or invalidity opinion letters, and counseling clients on designing around competitor’s patents. Associates at Gearhart Law can expect to have a “hands on” approach that entails experience, responsibilities, and opportunities that firms typically restrict to partners. As such, the candidate must excel in a team environment and be a highly motivated self-starter with excellent business judgment, outstanding written communication skills, and the flexibility to thrive in a fast-paced professional environment. Our compensation is competitive with peer firms and commensurate with our billable hour expectations. Additional compensation is provided for any originating business and meeting certain billable hour thresholds. If interested please send your cover letter, resume, undergraduate and law school transcripts, and three writing samples to: James Klobucar (james@gearhartlaw.com). 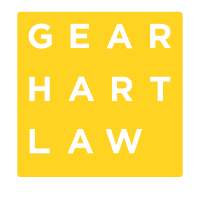 Gearhart Law is a preeminent IP boutique located in the New York metropolitan area of Summit, New Jersey. Since its inception in 2006, Gearhart Law has helped thousands of clients, from budding entrepreneurs to established multinational corporations, obtain meaningful and enforceable IP rights.